Blizzard conditions put pay to any chance of football being played last weekend across the country as the Beast from the East bared its teeth. 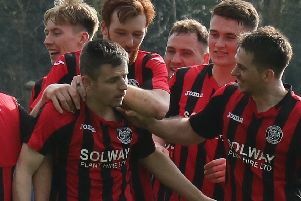 Threave Rovers’ match with Edusport Academy in the South Regional Challenge Cup was postponed as to was Newton Stewart’s clash with Queen of the South, Abbey Vale’s with Creetown, Nithsdale Wanderers and St Cuthbert Wanderers, Lochmaben and Heston Rovers and Lochar Thistle and Mid Annandale. The title race could not be much closer with just three points separating the top six teams in the South of Scotland League. St Cuthbert’s have reached the summit, a point ahead of Lochar Thistle and Mid Annandale, though have played five games more than Lochar and four more than Mid Annandale. This weekend St Cuthbert’s visit Abbey Vale, Lochar are away to Upper Annandale and Mid Annandale travel to Kilmarnock to face Bonnyton Thistle. Bonnyton slipped to fifth after defeat to Threave Rovers last time out. Weekend fixtures: Fri: Annan v Creetown (ko 7.30pm) Sat: (3pm unless stated) Abbey Vale v St Cuthbert Wanderers, Bonnyton v Mid Annandale, Lochmaben v Dumfries, Nithsdale v Heston Rovers, Threave Rovers v Newton Stewart, Upper Annandale v Lochar Thistle.